As the solvent of living cells, water is critical for all life on earth. This makes monitoring how environmental conditions impact evaporation and subsequently sensing and locating water sources important for animal survival. This is particularly critical for insects, whose small body size makes them highly susceptible to dehydration. In addition, moisture sensing, or hygrosensation, is also important for the spread of insect-born disease. Mosquitoes that spread malaria or viruses like dengue and Zika, not only need to locate bodies of standing water in which to lay eggs, but also home in on the moisture that emanates from our bodies when searching for a blood meal. This dual role for hygrosensing in mosquito biology makes their hygrosensory machinery a promising target for pest control strategies. Until now though, the genes and molecules that function in insect hygrosensation have been completely unknown. In a pair of recent papers in the journal eLife, researchers in the Garrity Lab at Brandeis University, in collaboration with colleagues at the University of Lausanne in Switzerland, have uncovered the cellular and molecular mechanisms that underlie insect hygrosensation using the fruit fly Drosophila melanogaster. Like mosquitoes, fruit flies detect humidity through specialized, innervated hair-like structures located on their antennae called sensilla. 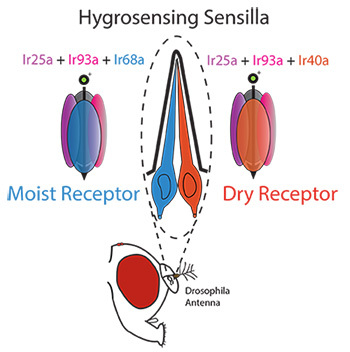 Each hygrosensing sensilla contains one cell that responds to increasing humidity (a moist cell), and one that responds to decreasing humidity (a dry cell). These papers demonstrate that the balance of activity between dry and moist cells allows the insect to seek out or avoid particular humidity levels, a preference which changes depending on how hydrated or dehydrated the fly is. To identify the molecules involved in sensing moisture, the researchers looked for mutant flies unable to distinguish between humid and dry air. They found that animals with mutations in four different genes disrupted the behavior. Strikingly, each of these genes encoded a different member of the same family of sensory receptors, the so-called Ionotropic Receptors or IRs. Although IRs are found only in invertebrates, they belong to the same family as the ionotropic Glutamate Receptors, which lie at the heart of communication between nerve cells in the animal brain, including the human brain. IRs differ from these relatives in that instead of sensing signals sent by neurons, they detect signals coming from the environment. IRs are best known to act as chemical receptors, but the group found that a subset of IRs act instead to sense humidity. The researchers found two broadly expressed IRs, Ir25a and Ir93a, were required by both the dry cells and moist cells while the other two IRs, Ir40a and Ir68a, were specifically required by the dry and the moist cells, respectively. This suggests that Ir25a and Ir93a contribute to the formation of both moist and dry receptors, while Ir40a and Ir68a provide the dry- and moist-specific subunits to the receptor. Consistent with this view, the loss of either Ir68a or Ir40a alone only partially reduces the animal’s ability to sense humidity, but animals with mutations in Ir25a, Ir93a or both Ir40a and Ir68a are completely blind to moisture. Having identified the specific genes required for sensing moisture, the next step is to determine the precise mechanism by which humidity activates these receptors. Furthermore, these genes are conserved in mosquitoes and other disease vectors, providing a clear path to translate what’s known about fly hygrosensation into the mosquito. These papers lay the groundwork for new mosquito control strategies that aim to precisely inhibit their ability to seek out water to reproduce and to seek out hosts to bite and spread deadly pathogens. A mystery has been unfolding at the intersection of pungent chemicals, temperate temperatures, and a question of detection: how do insects discriminate the noxious from the innocuous? At the center is a single protein, TRPA1; however, this puzzle has implications from human pain to bug spray. The subject of this story, TRPA1, is an ion channel gaining notoriety as an arbiter of agony. From mollusks to mammals, TRPA1 is a biological irritant detector: it responds to pungent chemicals like those in mustard, wasabi, and garlic. As we chop our onions and the tears flow, behind the scenes is TRPA1, gated by the reactive chemicals that waft into the air. In fact, TRPA1 may lurk below the surface for many forms of irritation – the burn, the itch, the cough – and is implicated in maladies ranging from asthma, to inflammation, and pain. In insects the story takes a twist, as TRPA1 mediates two senses. On the one hand, TRPA1 in fruit flies and mosquitoes responds to the same chemicals that act on vertebrate orthologs. In this role, TRPA1 stimulates gustatory neurons of the fly, detecting pungent chemicals and suppressing feeding before it is too late. On the other hand, insect TRPA1 also responds to warmth. Led by Brandeis University’s Paul Garrity, our lab demonstrated previously that TRPA1 is essential for the fruit fly Drosophila melanogaster to select a comfortable temperature (~25C, ~77F). Furthermore, our lab has demonstrated that TRPA1 is directly gated by warming (above ~27C, ~80F) acting as a molecular temperature sensor. This brings us to the mystery: if Drosophila TRPA1 is activated by nasty chemicals and prevents flies from eating, and also gets activated by heating, how can a fly eat in the heat? In a recent article published in the journal Nature, our lab reveals the mechanism. We identified two isoforms (from alternate promoters) of Drosophila TRPA1. The known isoform is gated by both pungent chemicals and warming. However, we identified a new isoform that is selectively gated by chemicals. Check out Figure 1: neurons expressing the first isoform respond to both chemicals and temperature whereas neurons expressing the new isoform respond selectively to chemicals. We also found that the temperature-insensitive form was expressed in the gustatory system of the fly, while the temperature-sensitive isoform is expressed inside the brain, so is shielded from chemicals. In this way, the fly can eat in the heat because only a temperature-insensitive TRPA1 is modulating feeding. The importance of distinguishing these two senses became clear when we mis-expressed the temperature sensitive isoform in aversive gustatory neurons. When these engineered flies were gently warmed, they began to vomit uncontrollably, a dramatic demonstration of the behavioral imperative to distinguish noxious from innocuous stimuli. Check out this video to see for yourself. We then examined TRPA1 isoforms from malaria mosquitoes and found the same functional dichotomy observed in Drosophila. This may explain how mosquitoes use a single channel to hunt for warm-bodied prey and avoid noxious repellents, and may provide two new targets for pest control: push on the chemical isoform to get bugs to leave you alone, or pull on the warmth-sensor to lure them to their death! Beyond bug-sprays and bug-zappers, we have some tantalizing clues to how TRPA1 may further modulate its own temperature- and chemical-sensitivity. The exact mechanisms are not clear but may have implications for the function of human TRPA1. So, the mystery continues, but one thing is certain: TRPA1 promises to keep things spicy. Last week the Genetics Society of America (or GSA) held their annual Drosophila Research Conference in sunny San Diego. Following a 52 year tradition, the meeting brought together some of the world’s greatest scientific minds to discuss all things fruit fly (formally known as Drosophila melanogaster). Brandeis Professor Leslie Griffith and alumnus Giovanni Bosco (PhD ’98), now at the University of Arizona, were among the meeting’s head organizers, and were visible figures throughout the course of the entire conference. Brandeis was also a commanding presence throughout the keynote talks, with Biologist Michael Rosbash kicking off the first night’s festivities. His lecture, which documented the history of fruit fly behavioral research, recounted a number of both professional and personal experiences with some of history’s most renowned Drosophila researchers, including Seymour Benzer and Brandeis’ own Jeff Hall. Neuroscientist Paul Garrity further represented Brandeis with his keynote address, titled “From the Cambrian to the Sushi bar: TRPA1 and the Evolution of Thermal and Chemical Sensing”. The talk, which discussed the molecular underpinnings of thermosensation in fruit flies, also demonstrated that these mechanisms are well conserved between many invertebrate and vertebrate species, and likely date back to a common ancestor that walked (crawled?) the earth millions of years before humans existed. Other presentations encompassed a number of exciting topics, including aging, immunity, population genetics, evolution, and models of human disease. Brandeis Professors Michael Rosbash (left) and Paul Garrity (right), both of whom were featured in this year’s Drosophila Research Conference Keynote Lectures. The next meeting will be held on March 7-11, 2012 in Chicago, Illinois. For more information, visit http://www.drosophila-conf.org/2012/. Update: see the later story on this blog about the Nature paper on which Alex is an author. Whenever you choke on acrid cigarette smoke, feel like you’re burning up from a mouthful of wasabi-laced sushi, or cry while cutting raw onions and garlic, your response is being triggered by a primordial chemical sensor conserved across some 500 million years of animal evolution, report Brandeis scientists in a study in Nature this week.